Make a straight sequel, or evolve the series? "The forges here at Blizzard are burning hot" said community manager Brandy Camel last week, letting us know that multiple new Diablo games are afoot. Blizzard job adverts a month or so ago asked for environmental, technical and dungeon artists in service of more Diablo games, and we might get our first glimpse of something new later this year—maybe at Blizzcon in November. Blizzard has reiterated several times that it still cares about the Diablo series even as Hearthstone and Overwatch continue to do well, but will Diablo return as an action RPG, or evolve into something new? Let's speculate about what Blizzard could do with Diablo next. Think about everything you love about Diablo—blasting thousands of enemies with cool spells, picking up loot in the aftermath, levelling a cool hero. Now imagine all that, but there’s also a player-driven shop where people can sell loot for real money. Ah, jokes. Diablo 3’s fraught development showed how hard it is to make a new game in the series. Even if you discount the auction house (as Blizzard did when it eventually shut it all down) Diablo 3 sacrificed and reworked a lot of features ahead of launch. At one point there were going to be pets. At another point the skill system worked completely differently. There was going to be a player vs. player arena, but that never emerged. A lot of these changes reflect the normal rough-and-tumble cuts that happen in game development, but it took years for Diablo 3 to get back to what fans really enjoyed about the series. I would take more expansions at the quality of Reaper of Souls, and more classes like the Necromancer, but it’s tougher to imagine a game different enough to justify the big ‘4’, but close enough to the Diablo fantasy to keep everyone happy. There is plenty the series could do better, though. In 2018 games are good at allowing quick and seamless grouping between players. Games like Destiny 2 also allow players at different levels to play together in most modes, with obvious restrictions for high level PvP modes and raids. Diablo should be an effortlessly social game that lets you check out friends’ builds and armour sets, and then group up to attack high level challenges. Personally I’d like faster combat that demands more skill, and class skills and abilities that have more utility in group play. All while still allowing for a satisfying solo experience, of course. I would also like a legendary Moon On Stick item, and Deckard Cain as a secret character class. Diablo 2 delivered bursts of co-op play with high levels of character customisation and buckets of semi-randomised treasure to chase—sound familiar? Diablo 2’s approach to levelling and loot progression has had a profound influence in the era of endless games like Destiny and Warframe. The MMO scene codified open world questing, dungeons and raids, but the Diablo 2 community has always made its own dungeons from specific area runs. In the year 2000 Diablo 2 created an enduring template for grinding. 18 years later it’s still quite effective. Since then many games from different studios have modernised aspects of Diablo 2. It ought to be possible to recombine those modernised elements with overhauled combat to create a game that can challenge Bungie and Bioware. That may require a controversial change in perspective, to a close third-person view or even first-person. Can the famous top-down view deliver the level of spectacle that new players expect in an era of Anthem? Vermintide 2 is one of the best games to come out this year so far. It proves that first-person melee fantasy combat can really work, especially when you’re constantly unlocking new weapons with distinct in-game styles. Combine that with Path of Exile style gem socketing, Destiny style dailies and weeklies, and set it in a dark and grandiose version of Diablo’s universe inspired by the series’ outstanding cinematics. It’s not the game long-term series fans are likely to want, but it could be pretty good. Deckard Cain shoves you out of a blimp into a hellscape overrun with demons and minibosses. Instead of finding new weapons and spells in houses you kill demons for them. As the boundaries of the map, represented by an infinitely tall wall of hellfire, close in, you have to take down other heroes in combat until you are the only hero left—you have proved your worth to fight the prime evil. At that point Diablo rises out of a ring of fire and kills you immediately. Better luck next time! ‘What if it was battle royale! ?’ is already becoming a stale joke, but let’s think about Blizzard’s history. StarCraft and World of Warcraft took existing formats, applied Blizzard’s chunky art style, and refined the idea into something palatable to the mainstream. This approach didn’t seem to work quite as well for Heroes of the Storm, but perhaps a gritty fantasy-themed battle royale will find favour among players put off by Fortnite’s garish battleground. If Resident Evil 2 can have a proper remake in a modern engine, then why not Diablo 2? A straight HD upgrade of the old art would be sweet, of course, but I would be curious to see Diablo 2 interpreted as a 3D game with high production values and monsters that explode real well. 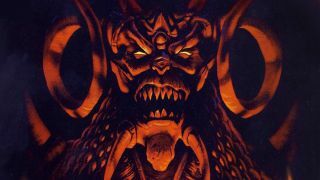 Diablo 2 creator David Brevik has suggested it would be very difficult to get a remake to feel like the original game, particularly in a modern 3D engine, but I like the idea of a reinterpretation of Diablo 2 from the perspective of new designers. The Resident Evil 2 remake is applying the camera angles of later games in the series, and rebuilding the environments free from the constraints of fixed backgrounds. It would be fascinating to see Diablo 2 receive similar treatment, then I'd like to run an old-school Necromancer with Poison Nova again at 4K resolution.